April 13, 2013  Relics of the Butte Mill at Randsburg (off of Randsburg Cutoff Road, immediately east of town). The Butte lode was discovered in 1896 and most of the ore was milled on site. The mill was equipped with two-five stamp batteries. Gold and tungsten continued to be milled into the 1950s (more information below). See the same view in 1949. 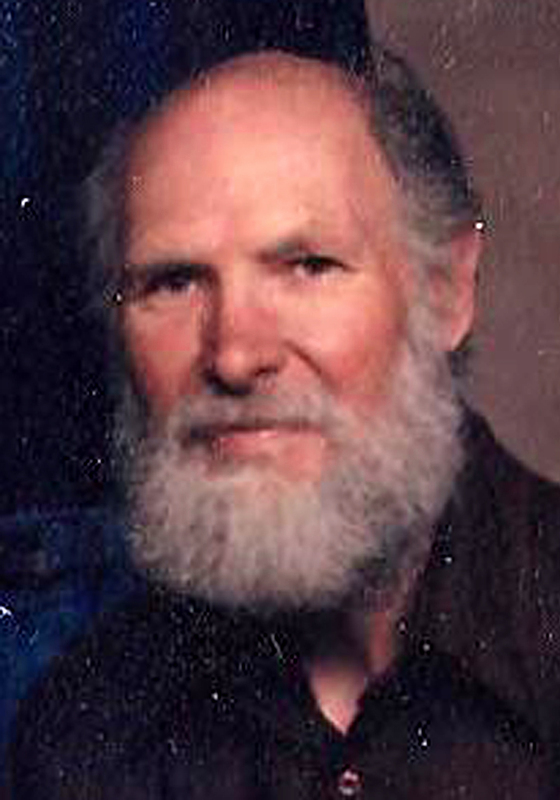 My uncle Bert Wegman owned the (Butte) mine and mill. I worked there, both at the mill full time — night shift — and hired out with miners who leased different levels in the mine during the day. Most were small, one-man operations; some a little larger. The Butte Lode mill processed ore from as far away as the Panamint range. The mill was kept busy with two shifts. The 10-stamper could be heard all over Randsburg. I was there in 1949. Butte (Big Butte, Butte Lode, Butte Wedge) Mine. Location: SW'/ 4 sec. 36, T. 30 S., R. 40 E., M.D.M., at; east end of town of Randsburg. Ownership: Butte Lode Mining Co., P.O. Box 195, Randsburg, Bert Wegman, pres., Louis Meehl, sec, owns five claims (1958). The Butte gold deposit was discovered in 1896 by three brothers — H.C. Sommers and Tate Ramie. By 1899, when the Butte Lode Mining Co. was formed, ore valued at approximately $140,000 had been produced. The most productive mining periods were 1896-1912, 1916-21, and 1925-42. Most of the mining was done by lessees; the ore being milled by the owners. During the depression years of the 1930s, when several groups of lessees covered nearly all of the mine, one group swept fines from the floors of stopes and milled them. The mine has been idle since 1942 except for a few short periods when the prospecting of old workings has yielded small lots of ore.
Total production from the mine is nearly two million dollars in gold and silver, and a few units of tungsten concentrates (Bert Wegman, personal communication, 1957). Wegman estimates that the average grade of the ore has been 0.75 ounce of gold per ton; the highest grade block of ore mined was 75 tons that yielded 7 ounces of gold per ton. Vein material that contained less than 0.25 ounces of gold per ton was put in the mine dumps and part of this has since been screened and the fines have been milled. Wegman (1957) estimates that the fines in the unscreened portions of the dumps contain about $6 per ton in gold. Each year he usually mills a maximum of a few tens of tons of the screened material. The dumps in 1957 contained several thousand tons of unscreened rock. Mesozoic quartz monzonite underlies a small part of the southeast portion of the mine area. Precambrian? Rand schist underlies most of the rest of the area. Tertiary? diorite, which is in a continuous dike several feet wide and extends three-quarters of a mile southeast and a mile northwest of the Butte mine, forms the hanging wall of most parts of the principal or Butte vein. The general strike of the diorite dike and the Butte vein is N. 50° W. ; they dip about 45° NE. The Butte vein is about 1,800 feet long on Butte Lode Mining Co. property and extends several hundred feet farther northwest into the Kenyon (Consolidated) and Little Butte mines (fig. 44). It also extends southeastward into the King Solomon mine. In the Butte mine, the Butte vein ranges in thickness from a few inches to several feet and extends to an inclined depth of 500 feet. Another vein in the hanging wall block of the Butte vein extends from a junction with the Butte vein S. 70° E. into the King Solomon mine. It resembles the Butte vein in thickness and composition and crosses the diorite dike southeast of the junction with the Butte vein. It has been mined in both the Butte and King Solomon mines. Most of the vein material in the Butte mine is silicified, iron-stained, and brecciated rocks of the footwall block-Rand schist, diorite, or quartz monzonite. In some parts of the mine the wall rock is so altered and bleached that it cannot be readily identified. The material in both veins lies between a well-defined hanging wall shear and a poorly defined footwall shear. Gold, mostly in the form of fine, free particles, is most common in the footwall of the vein adjacent to the hanging wall shear and is progressively less abundant toward the footwall. Sulfides, principally fine-grained pyrite, have been found in the relatively uncommon unoxidized parts of the veins. Scheelite has been found in the footwall of the Butte vein at one point on the 2 50- foot level west of the Rand shaft. The three principal ore bodies are in the Butte vein. The largest is in the southeast part of the mine and lies adjacent to a change in strike of the Butte vein northwest of the intersections of well-defined footwall shears or faults. This ore shoot has been mined from above the 65-foot level to the 500-foot level below which the gold content decreases. The strike length of the ore shoot, which rakes southeast, is about 100 feet on most levels and the shoot ranges in thickness from 2 feet to about 8 feet. A second ore body, which lies about 80 feet northwest of the upper part of the southeast ore body, is at the junction of the Butte vein and the vein that extends farther southeast into the King Solomon mine. This ore body has a strike length of about 150 feet and extends from a point above the 65-foot level to the 165-foot level and also appears to pinch out downward. The third ore body is a few tens of feet northwest of the middle ore body on the opposite side of a cross fault which has displaced the northwest segment of the Butte vein northward. This body is about 250 feet in strike length and extends from above the 165-foot level to below the 300-foot level. The Butte mine comprises more than 12,000 feet of horizontal workings on nine levels, three large stopes^ and seven shafts. The workings are in two groups separated by an unexplored segment of the Butte vein. This segment is 100 to 150 feet long at the surface. One group is in the southeastern part of the Butte claim and is interconnected with workings of the King Solomon mine. The other group is in the northwestern part of the Butte claim and in the Butte Wedge claim. The southeastern group consists of about 10,400 feet of drifts and crosscuts and four shafts. The shafts are, from southeast to northwest, the Ferris, No. 6, Road, and Midway, are inclined approximately 45° NE., and are from 200 to 400 feet apart. The No. 6 shaft is the deepest, is the only one that connects with all nine levels, and was the only one in operating condition in 1958. The nine levels are at inclined depths of 65, 100, 165, 200, 250, 300, 350, 400, 500 feet as measured down the No. 6 shaft. The Ferris shaft extends to the 250-foot level, and the Mid- way shaft to about the 200-foot level. The northwest group of workings consists of 1,600 feet of level workings and three shafts. The workings connect with about 800 feet of drifts and crosscuts on the Butte Wedge claim. The Perpendicular and an unnamed shaft, 240 feet apart, connect to drifts on three levels (121, 140, and 222 feet) and are connected by two drift levels. The No. 7 shaft is 100 feet deep and connects with two levels which aggregate 100 feet of drifts. A mill, between the No. 6 and Road shafts, is equipped with two five-stamp batteries, each with an amalgamation plate. One battery is modified to treat ores on a gravity table. At least one of the batteries has been operated nearly continuously in recent years as a custom mill for gold and tungsten ores. Since 1956, the Butte mill has been the only stamp mill in southern California in which custom gold ores have been accepted. Ores that can be suitably milled by gravity separation also are accepted at the mill. Water for the mill is supplied from a source below the 500-foot level of the mine. Prospectors Frederic M. Mooers, William J. Langdon and B. F. McGee had been placer mining in the El Paso Mountains, east of Red Rock Canyon and south of Ridgecrest, when in 1894 they ventured south to explore the Rand mountains. They found little "color" and went back to the dry wash which had been worked since the 1850s when a German named John Goler discovered significant amounts of gold in what became the Summit Range Mining District. But an especially wet winter in 1894-95 made placer mining impractical, so Mooers returned to the Rand region in 1895 with a new partner, John Singleton, and took a closer look. According to a subsequent report in The (Bakersfield) Californian, the volcanic mountain 40 miles northeast of Mojave was "covered with 'float' showing free gold as large as wheat grains to the naked eye." Mooers, Singleton and a third partner, Charles Burcham, staked their claims April 25, 1895. Originally incorporated as the Rand Mountain Mining Company  named for the Rand Gold Mining District in South Africa  they soon changed the name to Yellow Aster Mining and Milling, from a new novel one of the men was reading at the time ("A Yellow Aster" by Hunt Caffyn, 1894). The Rand Mining District was organized Dec. 20, 1895, out of the Summit Range District. Mooers, Singleton and Burcham sank "a fifteen foot shaft and developed a ledge six feet wide between well-defined walls of prophecy and mica schist," according to the San Francisco Call of Jan. 27, 1896. "They then began prospecting for other ledges and located fourteen other claims." No sooner had they paid their registration fee  with some difficulty  than word got out. The area filled up with hundreds of "prospectors, investors, fortune-seekers, and mining experts from South Africa to the Caribous and the Comstock to the Atlantic," according to the Call, which declared that Randsburg, as the camp was called, would surely become "the loadstone of the mining world." "Over $250,000 has been extracted from the mines of this camp by the original locators within a period of six months," the paper reported. Ore was hauled out by the Searles Borax team to Mojave and shipped to the Selby works in San Francisco, the Call said. By the start of 1896 there were "five wooden buildings, including stables, corral, saloon and about thirty tents." Later that year the nearby supply town of Johannesburg was established. That same year, the prosperous Tehachapi farmer Eugene Garlock constructed a stamp mill at Cow Wells, as the place was known by prospectors and freighters in the 1880s and early 1890s. Renamed Garlock and situated about nine miles west-northwest of Randsburg near today's Redrock-Randsburg Road (which connects Highway 14 on the west with Highway 395 on the east), the location provided water that was carted to Randsburg in 1896 and 1897 at $2 a barrel. By late 1897, under Singleton's superintendency, the Yellow Aster had 65 men on payroll and was leasing at least one of as many as three stamp mills at Garlock (the Visalia Mill). 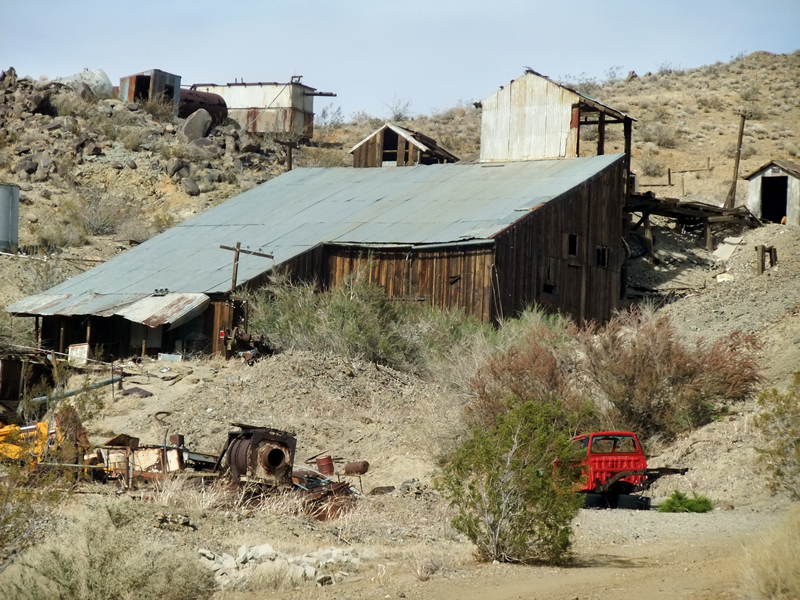 Running day and night, the mill crushed as much as 20 tons of ore daily from the Yellow Aster until 1898, when the Kramer-Randsburg rail line was completed and the ore was hauled to a new 50-stamp mill in Barstow. A 30-stamp mill was also erected in that year at the Yellow Aster, and in 1901 a 100-stamp mill was added on site. The Barstow mill was no longer needed. The Yellow Aster mills used water piped in from Garlock. By this time, according to authors Peter G. Massey and Jeanne Wilson, Randsburg's population swelled to 3,500 and the town sported "hotels, saloons, a general store, an Orpheus theater and even a brass band." The Yellow Aster operated nearly continuously from 1895 to 1918 and reopened in 1921. In 1933 the Anglo American Mining Corp. Ltd. leased it and operated it until 1939. There have been intermittent lessees since that time. According to reports from the California Division of Mines and Geology, the Yellow Aster's rich, gold-bearing placer was initially worked in dry washers in 1895. After the easy pickings were depleted, "mining was conducted underground and by 1905 about seven and one half miles of horizontal underground working had been driven. Most of the ore mined from 1905 to 1933 was obtained from a large glory hole, but underground mining was continued and, by 1909, workings totaled between 12 and 15 miles in length." In 1934 a sand and slime cyanide plant was built to treat 1,100 daily tons of both old and current stamp-mill tailings. "Between 1895 and 1939, more than 3,400,000 tons of ore was milled, and about 500,000 ounces of gold was recovered, nearly all by amalgamation. In addition, 1,700,000 tons of mill tailings was treated and yielded 41,000 ounces of gold." As stated, mining was nearly continual in the early years. Although there were other mining concerns in the area, the Yellow Aster was the big dog, and the laborers wanted to share in its success. In September 1902 the Federation of Miners union of Randsburg demanded that the car men and shovelers (top-siders), who earned $2.50 per day, be paid the same wage as the underground miners, who earned $3. Singleton resisted, and by June 1903 the union was demanding $3.50 for the miners and $3 for the muckers. On June 10 they voted to walk out  not only from the Yellow Aster but also from several other mines in Kern County. The Yellow Aster shut down rather than concede to the union. "Because of the miners' strike at Randsburg all business is at a standstill and merchants are giving no credit. The camp is practically dead," the San Francisco Call reported. Strike-busting was illegal under state law, but the Yellow Aster did it anyway. John D. Ackerman, the company's attorney and agent in San Francisco, recruited non-union miners from Missouri and elsewhere, and in mid-September mining resumed with 60 new employees. In solidarity with the union, the mayor shut the saloons. By early October, the Yellow Aster was fully operational with roughly 200 men. Ackerman went into hiding and ultimately surrendered to authorities, but the charges were dismissed in June 1904 when the three witnesses for the prosecution failed to appear in court. The Yellow Aster didn't increase wages during this period; ironically, they were already above average. They were reported in January 1904 as follows: "Miners nine hours $3.00; muckers 9 hours $2.50; car men 9 hours, $3.00; timber men 9 hours $3.50; amalgamators 12 hours $4.00; stationary engineers 12 hours $4.00; hoisting engineers 8 hours $3.50; and the pump men 12 hours $3.50." At the time, the Yellow Aster consisted of the following individual mines: Alameda, Big Horse, Burcham #1, Burcham #2, California, Columbia, Defender, Desert View, El Rico, Fannie C., Golden Queen, J. B., Johannesburg, Mariposa, Mooers, Nancy Hanks, North End, Old Dollar, Olympus, Prescott, Rand, Reservoir, Wedge, Scott, Security, Singleton, Tennessee and Trilby Wedge. Gold production tapered off after the 1930s but didn't stop entirely. It continued through the 1960s and still occurs intermittently on a small scale. The lucrative Kelly Silver Mine, aka California Rand Silver Mine, was discovered in 1919 and was worked on a major scale through the 1930s. Tungsten, a strategic material, was mined during the first and second world wars. Today Randsburg bills itself as a "living ghost town" with numerous antique shops, a museum, bar, and plentiful accommodations for off-road enthusiasts. 1. Most newspaper citations used herein are found at the nonprofit Rand Desert Museum's website. 2. Turnabout being fair play, in 1913, Wallace Reed ("Birth of a Nation") would star in the film, "The Mystery of Yellow Aster Mine" by Frank Borzage ("A Farewell to Arms"). 3. According to The Los Angeles Daily Times of May 20, 1898, there were three stamp mills at Garlock: the Henry, the Garlock and the Visalia. 4. The Garlock mills continued to process small quantities of ore until Eugene Garlock's death in December 1907. 5. "Backcountry Adventures Southern California," Adler Publishing Co. 2002. Third printing 2006. LW2369b: 9600 dpi jpeg from digital image by Leon Worden.